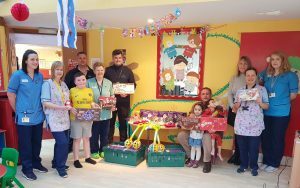 Hillcrest staff members have brought more than just good tidings to Tayside Children’s Hospital at Ninewells, donating selection boxes and gifts. The staff from Hillcrest’s Tom Johnstone Road office in Dundee donated the gifts, aiming to bring some Christmas cheer to the young patients. The trio who made the journey on Tuesday 4th December were Hillcrest Maintenance Service operations supervisor Brian Jones, Hillcrest Maintenance Service lead gas engineer Steven Meach and Customer Service admin assistant Carol Shearer. This year wasn’t the first charitable trip to Ninewells. Last year staff members raised funds and donated them to the Oncology ward at the hospital. Carol, who coordinated this year’s festive gift giving said: “At this time of year, everyone is starting to get absorbed into the festive cheer. With so much excitement around us, it can sometimes be easy to forget those who may be in a less fortunate position in the run-up to Christmas.